San Carlos and much of San Mateo has been hit with the results of a strike led by workers for Allied Waste. 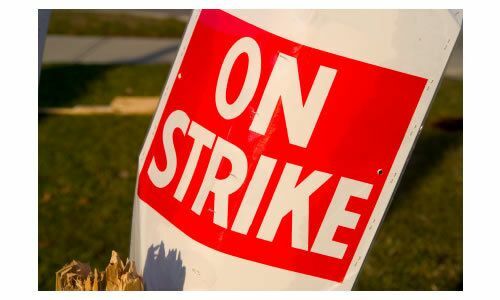 The strike is expected to last for a few days. In the mean time, get used to seeing trash cans blanketing the city streets. Local Teamsters 350 Union appears to be leading the strike after being upset about stalled contract negotiations. Over 500 Teamsters that work at Allied Waste are honoring the picket line. There are 12 clerical members on strike, and hundreds more workers who honored the picket line of their fellow workers and stayed away from work. The clerical workers, who are mostly female, apparently do not have the same health, welfare and pension benefits or wages as the male workers at the company. Allied Waste has reportedly refused to make an offer to the clerical workers with comparable benefits and wages to the male workers. Local 350 has filed unfair labor practice charges against the company on behalf of the clerical workers. This issue I take with this strike is that they clearly waited until the hottest days of the year and moved forward with the strike. The timing of this strike clearly makes the action punitive in nature and leaves the residents in a real bind. If your pay and benefits were different from other employees in your firm because of your gender, you might have a different perspective. Of course no one wants smelly garbage piling up but the fact is, employees should be treated fairly. Would I be terribly out of line by suggesting that the “male” employees take a pay/benefit cut to bring them in line with the “female” employees instead? I don’t mind my street smelling funky for a while to get this done… Next the City of San Carlos can negotiate with Allied Waste to bring our rates down? I don’t think Bob’s point was equal pay between the genders. The point is that it was most likely a calculated move to have the strike on the two hottest days of the year which hurts the general public and Allied. Not exactly a good move for putting public sentiment on your side. This strike could have been on any of the other days of the year, yet these days were chosen. My pay and benefits are different than that of the executive staff where I work, should I strike? And the janitorial staff receives wages that are different still. Why shouldn’t the pay and benefits for office employees be different than that of folks required to work very physically demanding outdoor jobs? It would be an entirely different story if female sanitation workers were making less than male, but not even the striking workers are claiming that. Isn’t AW losing most of San Mateo county come January 1st? I don’t think this is a gender issue, I think this is a job classification issue. The female workers are mainly office and secretarial workers, while the male workers are the ones doing all the physical work. Of course they are going to have different benefit and pay structures. Just like how Police and Fire have better benefits than City management. That’s right. Allied Waste is out the door at year’s end. Recology takes over Garbage & Recycling Pick Up service in San Carlos and most of San Mateo County on Jan 1st. That’s what I thought, re: AW being finished. When the first flier came in the mail describing the changeover, I thought, “Well guess we better be prepared to have our trash dumped all over our lawns later this year.” Me thinks these shenanigans have a lot more to do with losing the county’s business than it does how much the customer service folks are making an hour. Just a theory. The clerical workers (men and women) who walked out in sympathy with the 13 Ox Mountain landfill workers have not even finished negotiating their contract yet. They are brand new members of the union, and they’ve only been negotiating terms for 6 months (some initial contracts take over a year to work out). Does anyone think that a clerical worker should get paid the same as a heavy equipment operator? I sure don’t. To me the real problem here is that we, the San Mateo residents paying for the garbage collection services, are going to pay for whatever they negotiate. The San Mateo agreement allows the hauler to pass all costs onto us – yes, that’s all labor costs associated with collection. I admire Allied for not just giving the union everything that they want – it shows that they do feel a responsibility to us residents.